Background and objective: The modulus of carbon fiber-reinforced polyether ether ketone (CFR-PEEK), a composite containing layers of carbon fiber sheets, can be precisely controlled to match bone. However, CFR-PEEK is biologically inert and cannot promote bone apposition. The objective of this study was to investigate whether graphene modification could enhance the bioactivity of CFR-PEEK. Methods and results: In vitro, the proliferation and differentiation of rat bone marrow stromal cells on scaffolds were quantified via cell-counting kit-8 assay and Western blotting analysis of osteoblast-specific proteins. 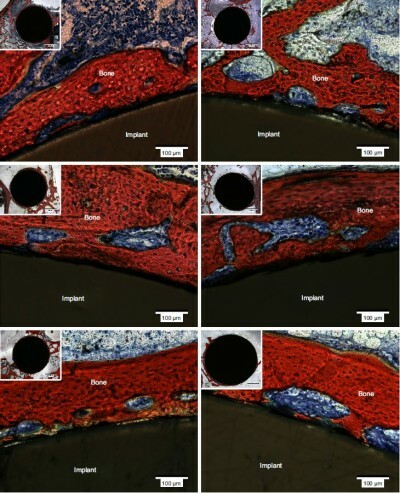 Graphene modification significantly promoted bone marrow stromal cell proliferation and accelerated induced differentiation into osteogenic lineages compared to cells seeded onto nongraphene-coated CFR-PEEK. An in vivo rabbit extraarticular graft-to-bone healing model was established. At 4, 8, and 12 weeks after surgery, microcomputed tomography analyses and histological observations revealed significantly better microstructural parameters and higher average mineral apposition rates for graphene-modified CFR-PEEK implants than CFR-PEEK implants (P<0.05). van Gieson staining indicated more new bone was formed around graphene-modified CFR-PEEK implants than CFR-PEEK implants. Conclusion: Graphene may have considerable potential to enhance the bioactivity and osseointegration of CFR-PEEK implants for clinical applications.